First edition. The 'Nuremberg Chronicle' is regarded as the most richly illustrated incunable and the biggest book venture in the era of Dürer. The 32 authentic, double-page views are at the heart of the Chronicle's great popularity, even until today. This copy features the original publisher’s colouring. The famous Nuremberg Chronicle was compiled by the Nuremberg physician, humanist, and bibliophile Hartmann Schedel (1440-1514) and is based on works of Jacobus Bergomensis, Vincent de Beauvais, Enea Piccolomini, and others. Schedel, who had studied medicine in Padua, owned a library of more than thousand books. He divided his world history into seven ages, from Creation until the Last Judgement. The sixth era, the largest part, opens with the birth of Christ and continues through Schedel's own time. The book was commissioned by the rich Nuremberg lay assessor Sebald Schreyer (1446-1520) and his brother-in-law, the patrician Sebastian Kammermeister (d. 1501). The artists Michael Wolgemut and Wilhelm Pleydenwurff provided the designs for the woodcuts, assisted by at least two further illustrators from Wolgemut's workshop. Most important are the thirty-two magnificent, double-page views of places such as Augsburg, Bamberg, Basel, Breslau, Florence, Cologne, Munich, Nuremberg, Prague, Rome, Salzburg, Ulm, Venice, and Vienna, many of which are the first printed – often quite accurate – portrayals of these cities. The large map of Germany is the first to appear in a printed book. 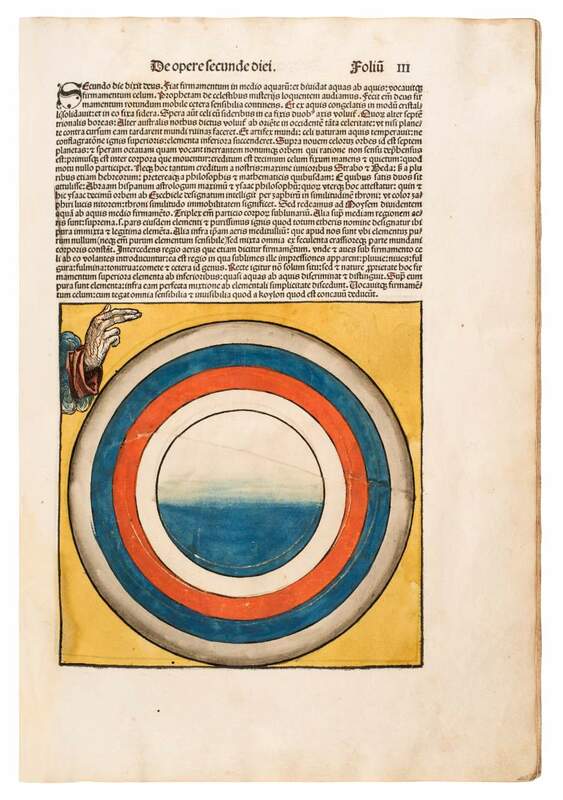 The colouring of this copy is very similar to that of Schedel's own copy (now in Munich at the Bayerische Staatsbibliothek) and is also known in other copies. This suggests these were coloured in Koberger's workshop, the most prolific and efficient printer and publisher of his day. Although it was an unsuccessful venture after its publication, the Nuremberg Chronicle marked a new age in the history of printing and greatly influenced the development of woodcut art.